Climate change is not well suited to the classical scientific method of hypothesis testing through controlled experiments. It is impossible to conduct controlled experiments on the atmosphere, it is too big and continuous. The system cannot be manipulated in a controlled way so there is no chance of a real experiment. Plus there are no replicates of the earth to leave unaltered for comparison. Observations can be made of what is happening to measureable components of climate change and, thanks to various clever techniques, what happened to these components in the past.Measurements over time create trends, cycles and patterns that can be analysed for their significance, then thought about and interpreted.This 'after the fact' or a posteriori approach is sometimes called historical science. Models that simulate complex natural processes and then predict what happens to these processes and their outcomes when conditions change.Thanks to considerable computing grunt, modern models are sophisticated process-based tools that use a combination of rules and probabilities (likelihoods) to both analyse patterns and predict future outcomes.Most climate models are sophisticated tools that simulate the complex heat and fluid dynamics of the atmosphere and oceans to determine their effect on climate. They are very good at predicting aspects of climate change given various input scenarios. What both these tools lack is the power of controlled experiments to be definitive. Answers from observations and models are presented as a likelihood or a prediction. Consequently, cause must always be inferred. It is hard (some purists would say impossible) for observation or computational prediction to provide definitive proof. When experiments are impossible,definitive determinations are not possible. Cause and effect can only be inferred using what is sometimes called historical science. Historical science tracks measurements as they vary over time, then examines and tests any trends to see if they differ from what would be expected by chance. This is done using statistical tests of inference. For example, the increase in CO2 concentrations as measured directly at the Mauna Loa observatory in Hawaii since 1974 is greater than would be expected by chance. The average for this sequence of observations is around 360 ppm. If only chance were determining the sequence, values would fall above and below this average amount at random. On average they increase steadily around a cyclical pattern within each year that creates an upward 'saw-tooth' curve. Science has no problem in determining that this trend is significant - the statistical tools of correlation and regression that tell us this definitively are known to many high-school students. What we cannot say is why. Statistical tools tell us there is a trend but not what caused it. This leaves climate science with an attribution problem. It is easy enough to determine there is a trend but not what caused it. Models are a way to conduct abstract 'experiments' by estimating through computation what happens when the inputs to system change. used to drive the model. Climate models have become complex but they struggle to incorporate the many processes that deliver the patterns in weather that we call climate. Ultimately they remain, by definition, abstractions, an attempt to generate a description of the real world. Models generate predictions that can be tested against future observations. The challenge for climate is we have to wait a long time to check the climate change predictions. So climate science has some things that are settled. We know that they are true because we can measure them directly. The main truth is that CO2 levels are rising and have been for several decades. We also know that temperatures have been rising creating a suite of climate change effects. Most of the logic and the modelling predictions attribute the global warming to the increase in greenhouse gas concentrations. There are aspects of the climate science that are less certain. The most important being that we do not know the scale, intensity and location of the climate change effects. And then there are climate change issues that are nothing to do with the science, most importantly, what we should do about it. As with all things scientific there are knowns and unknowns. 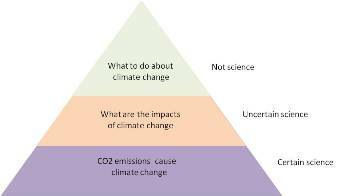 Much of the climate change issue is a conundrum because there are many unknowns. Some of them may actually be unknowable. None of this means that we can ignore the reality of the finite world, heavily modified by 7 billion humans all with an apetite for betterment.